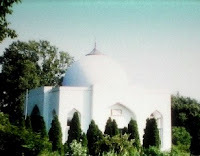 Some 40 miles from Philadelphia, among the rolling hills and tall trees of Chester County, is a Mazar (a shrine), the resting place of Muhammad Raheem Bawa Muhaiyaddeen, the Sufi saint and founder of the Bawa Muhaiyaddeen Fellowship, who left his physical body in 1986. 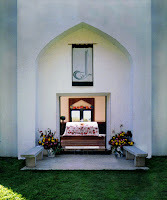 This video is a 2 part series for Voice of America explores this Muslim shrine, the first in the United States. Since its dedication it has become an important destination for pilgrims from all over the world who wish to pay their respects to the Sufi saint. The first part talks about the "Mazar" (the shrine built by his followers in his memory) and the second part takes the viewers to his Mosque and talks about the Bawa Muhaiyaddeen fellowship. Although the narration is in Urdu language, but inside the interviews of students of Bawa are in English, worth listening. 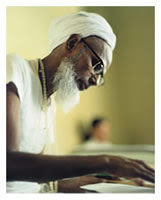 There students share about Bawa's coming to US from Sri Lanka, how it was to be with him and how their intense mystical or otherwise experiences were interpreted by Bawa's tremendous wisdom.